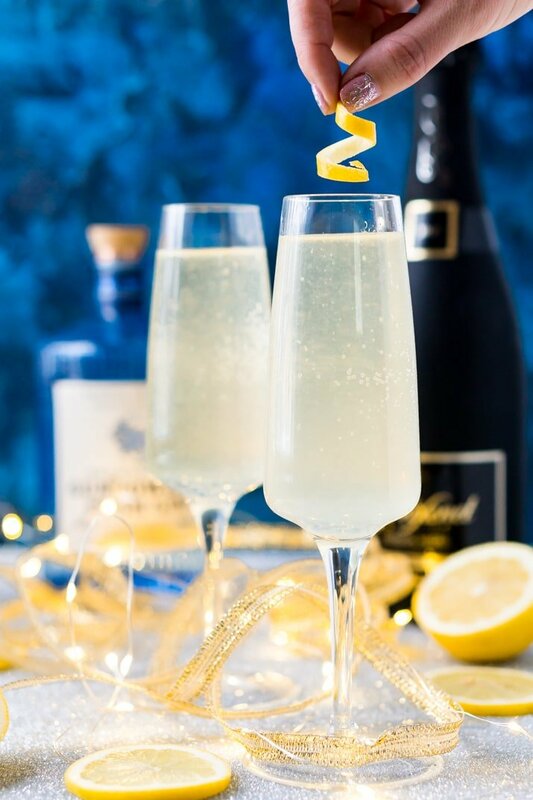 French 75 is a classic cocktail that combines bright citrus with the earthy notes of gin and the sparkle of champagne. A delicious drink recipe for parties, New Year’s Eve, brunch, bridal showers and more! Once again the end of the year is near and we’re probably all living in a holiday stupor after all the fudge and Christmas Punch we drank the last few days. But New Year’s Eve is still ahead of us and that means the bubbliest holiday is yet to come! I’ve never been a huge fan of champagne on its own, but I absolutely love it in mixed drinks! 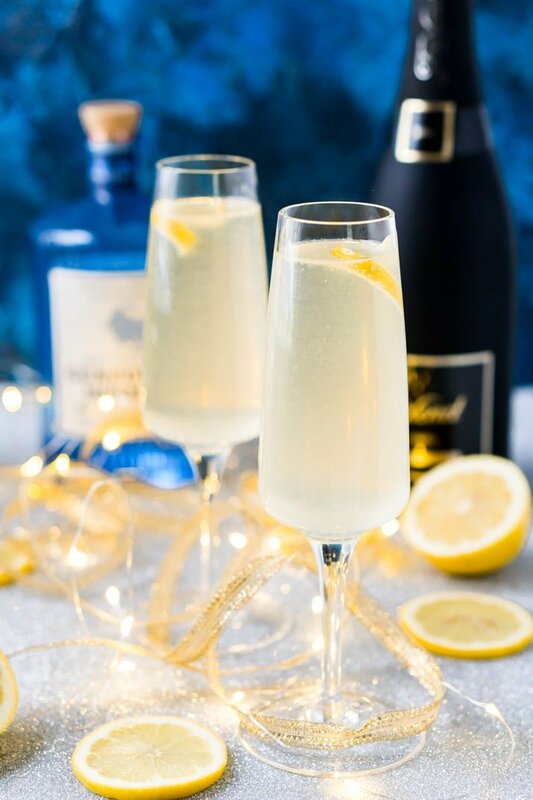 And this French 75 is one of the most classic champagne cocktails! It’s a classic cocktail made with gin, simple syrup, lemon juice, and champagne. Many believe it’s a spin on the classic Tom Collins made with similar ingredients but with champagne instead of the usual club soda. Why is it called a French 75? The drink was created in 1915 at the New York Bar in Paris—later Harry’s New York Bar—by barman Harry MacElhone. The combination was said to have such a kick that it felt like being shelled with the powerful French 75mm field gun, also called a “75 Cocktail”, or “Soixante Quinze” in French. What Kind of Champagne do you use in a French 75? Traditionally, the drink was made with a Brut Champagne, but you can use whatever Champagne, Prosecco, or Cava you would like. They are all sparkling wines, but the different names come from the regions they’re from. Champagne is from France, Prosecco is from Italy, and Cava is from Spain. 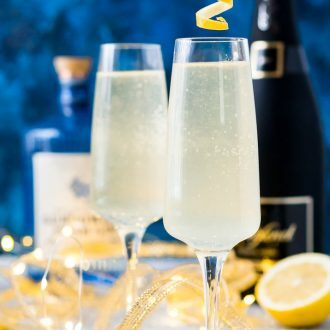 The French 75 is a pretty, classic, and perfect cocktail for simple celebrations like brunch or huge parties for New Year’s Eve or celebrating a Bride-to-be! It has a lovely citrus flavor with a hint of botanicals from the gin, and the simple syrup gives it a deliciously sweet finish. It’s a simple cocktail and that means you want to make sure you use fresh, quality ingredients because you’ll be able to taste them all. Pick a nice sparkling wine, it doesn’t have to be the most expensive, but make sure it’s not the cheapest either. A bottle of Cook’s just won’t do this cocktail justice. Make sure to use fresh lemon juice and a gin you enjoy! Champagne Flutes: Depending on your style and setting, you could serve these up in either disposable flutes or traditional glass ones. Cocktail Shaker: You’ll need a shaker to mix the cocktail. 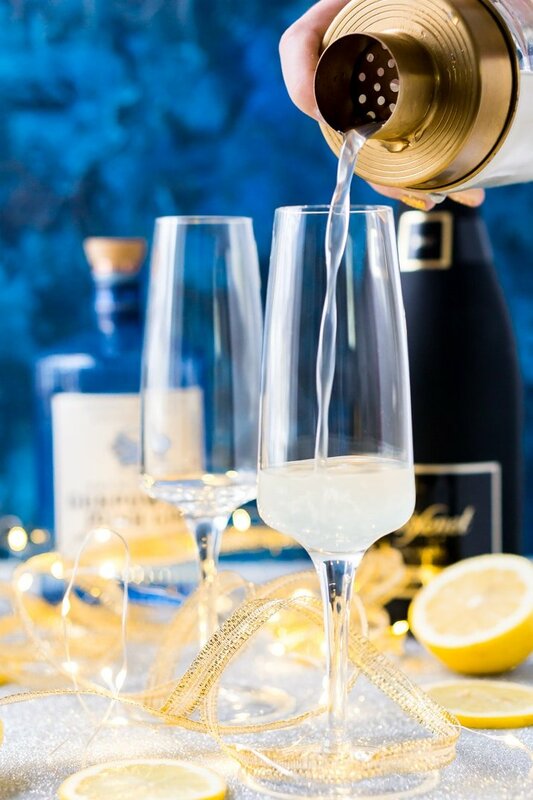 Lemon Peeler: The signature component of a French 75 is the lemon peel, you’ll want this tool to make it nice and easy! 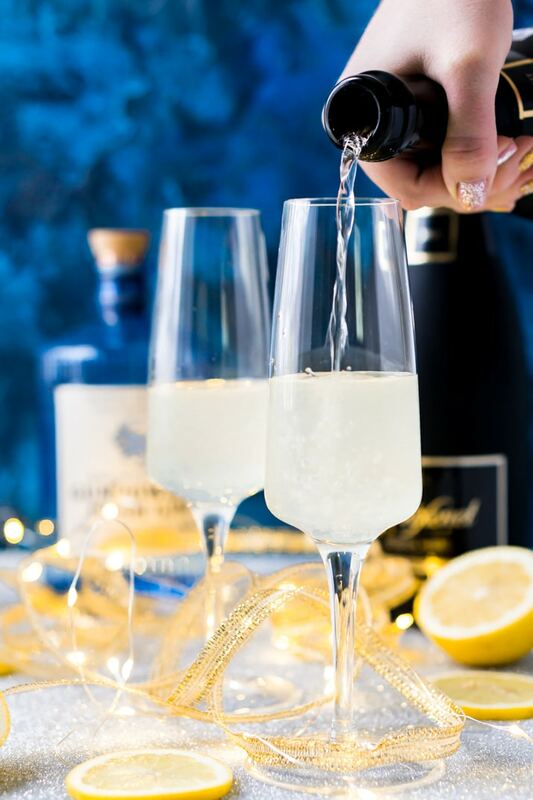 French 75 is a classic cocktail that combines bright citrus with the earthy notes of gin and the sparkle of champagne. A delicious drink recipe for parties, New Year's Eve, brunch, bridal showers and more! Combine ice, lemon juice, simple syrup, and gin in a cocktail shaker and shake. Strain into a champagne flute and top off with chilled champagne. Keep lemon twists curled by placing them in the freezer for 5-10 minutes. Can substitute simple syrup with 1 tsp of super fine sugar such as Casters Sugar. If you want a stronger cocktail, add an extra ounce of gin. 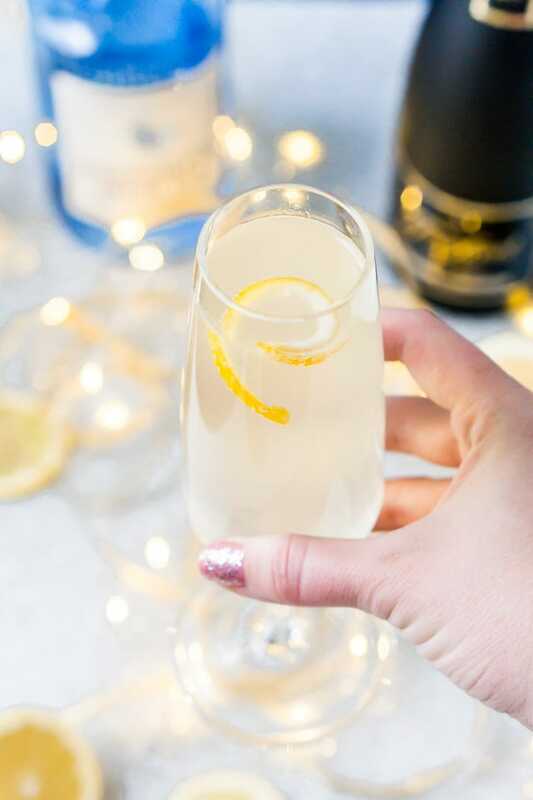 Pin this French 75 Recipe for Later! This post was originally published December 2014 and updated December 2017. This drink has my name written all over it! Sounds delish and so very Mad Men 😉 PS- wha??? More Breaking Bad, for realz? I know, right!? My mom told me last week and I was like, no way! Mixed feelings about it, but excited!